What is your specialty? I have damaged arthritic hands, so have been doing rustic, brass, copper, and German silver pieces. I anneal my pieces before starting, this eases the cutting and forming of my work. I use found objects, vintage jewelry which I dissemble and repurpose, and everything from bones to elk teeth and rusty goodies to create one of a kind pendants earrings and bracelets. If I can’t make my customers smile I have a failed my mission. I do sketches, find or make unusual fittings. I patina my found treasures using mostly every day kitchen cleaning and cooking items like salt , vinegar, ammonia, and heat enhancement. I do acid etching, dapping, soldering, and clunky unique riveting. If you see a piece that’s perfect, “It isn’t mine”. I purchase strange metal, glass, bone, and stone beads from many countries. 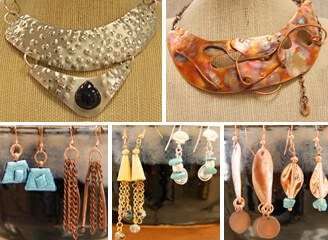 I design and make crude clay beads that have strange textured and shapes. 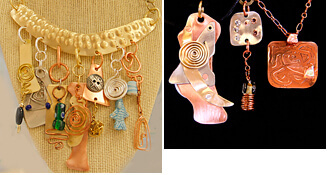 Bottom line, my jewelry is wacky, fun, and kicky .I’m thankful to have the same kind of loyal wonderful customers. Doing what I love makes getting up every morning a pure joy! Awards, publications, recognition? I have won the Good Housekeeping and American Craft Assn, contest, and Arizona Quilters Guild first places for my wearable art. 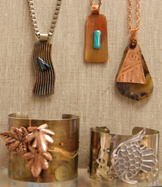 “I work with copper, brass, and German silver as my starting point. I make earrings, bracelets and necklaces incorporating metal, glass, found treasures, rustic beads, gems, stones, and disassembled vintage pieces.